Are you looking for lagoonfront homes for sale in Ocean City NJ? Having a lagoonfront home means enclosure from bad weather. Lagoonfront homes make for a great place to dock your boat from nasty weather and a place to cool off an take a dive in the bay on those hot summer days. Click above on the map to view all lagoonfront homes. 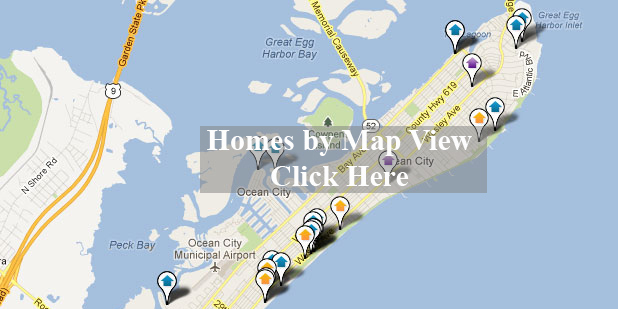 Lagoonfront homes for sale in Ocean City is our specialty. Above are just a few of the newest lagoonfront homes to hit the market. Our website provides you the ability to view all active listings in Ocean City, Strathmere, Sea Isle City, Avalon, Stone Harbor, Wildwood, and Cape May. The site is easy to use for all your property search needs. Featuring the best foreclosures, bank owned homes, land, and homes for sale at the Jersey Shore. Contact us! Sign up to the right to receive free daily email alerts as they hit the market.